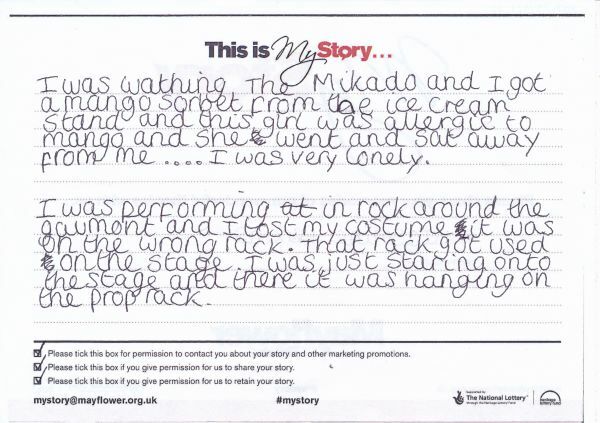 My Story card: Jasmine Perkins remembers losing her costume whilst taking part in Mayflower Musical Youth Theatre's production of Rock Around the Gaumont. I was watching The Mikado and I got a mango sorbet from the ice cream stand and this girl was allergic to mango and she went and sat away from me… I was very lonely. I was performing in Rock Around the Gaumont and I lost my costume; it was on the wrong rack. That rack got used on the stage. I was just staring onto the stage and there it was, hanging on the prop rack.